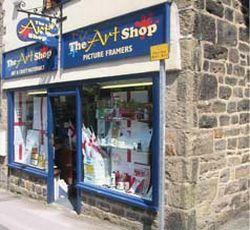 The Art Shop01943 432016 work Shop - Arts & CraftThe Art Shop has stores in Ilkley, Skipton & Northallerton full of art & craft materials for the professional, serious amateur or leisure painter. The Art Shop is a family run business established in Ilkley in 1919 and provides first class customer service and a wide range of materials at the best prices for all types of artists. We provide expert & professional advice for all customers, a wide choice of materials at competitive prices & many special offers. A full picture framing service is also provided with all work carried out in our own workshops. We offer discount to students & art club members as well as larger discounts to Clubs & Societies. Our annual show is held in Ilkley every August. It includes many painting demonstrations by leading artists, materials at discount prices & art workshops. The Art Shop has stores in Ilkley, Skipton & Northallerton full of art & craft materials for the professional, serious amateur or leisure painter. The Art Shop is a family run business established in Ilkley in 1919 and provides first class customer service and a wide range of materials at the best prices for all types of artists. The show also includes our annual Art Exhibition open to all artists & works of any media.